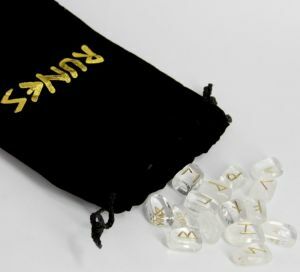 Use for Divination - A range of Natural Quality Norse Crystal Runes Stone Sets with gold embossed Rune Symbols from The Realm of White Magic - order online! Empower your Realm of spiritual well-being with the magic of Incense, Herbs, Powders, Crystals, Spells and much more. Specialists in rare botanicals, incense and magical supplies since 1989. 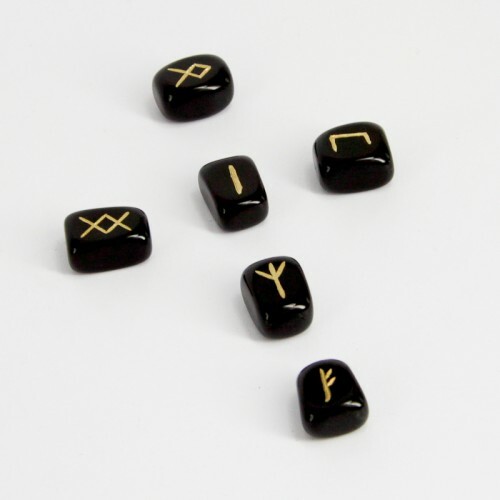 These Norse Runes are also called the Futhark Runes, a name taken from the first six letters of the Runic alphabet. 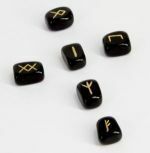 Runes are sticklike letters, remnants of ancient alphabets. These symbols are carved or painted onto stones which are kept in a special place. 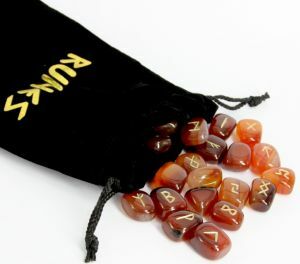 Runes can determine possible future events and are very popular as a divination tool. 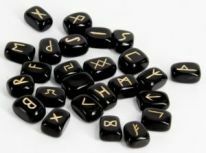 They are also used in image magick and have long been thought to possess powers. 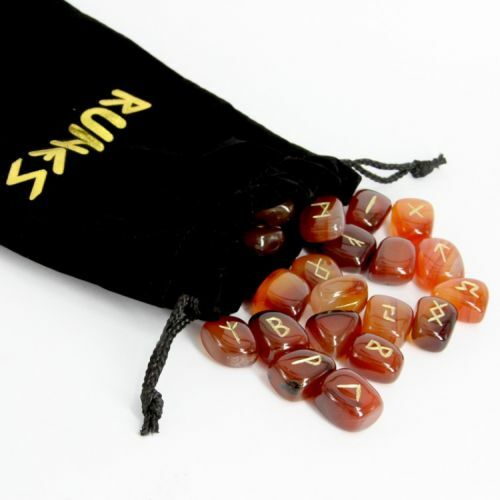 Reflective or high polished stones have been used for centuries in developing psychic awareness. 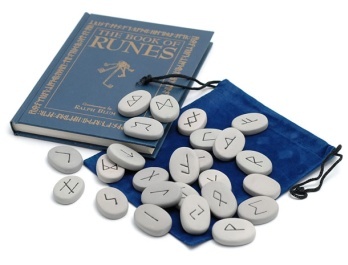 Looking For A Good Book About Runes? 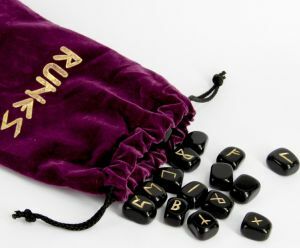 Click Here & See Under "Divination Books"
Hematite, Rose Quartz, Amethyst, Aventurine, Obsidian, Carnelian, Clear Quartz. 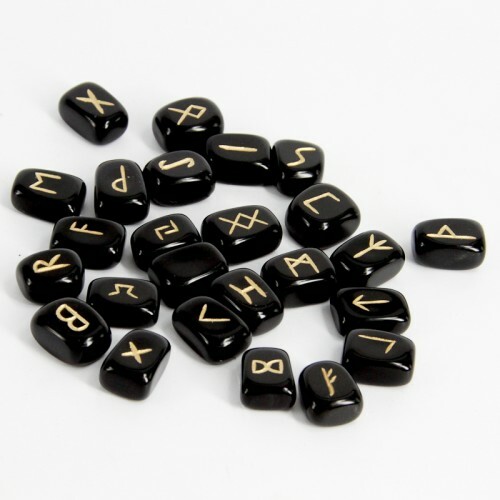 A set of 25, natural tumbled Hematite Rune Stones, embossed with gold runic symbols. 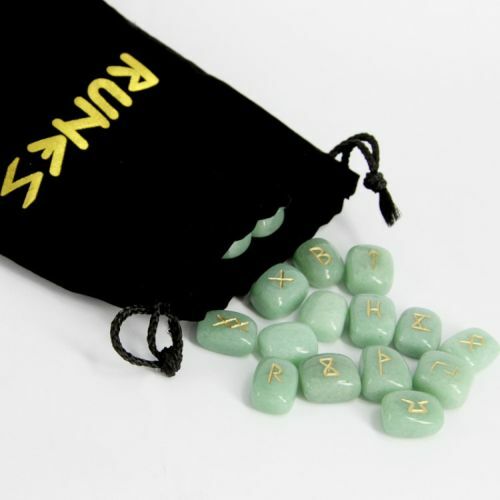 These Rune Stones are beautifully polished and so smooth to touch. 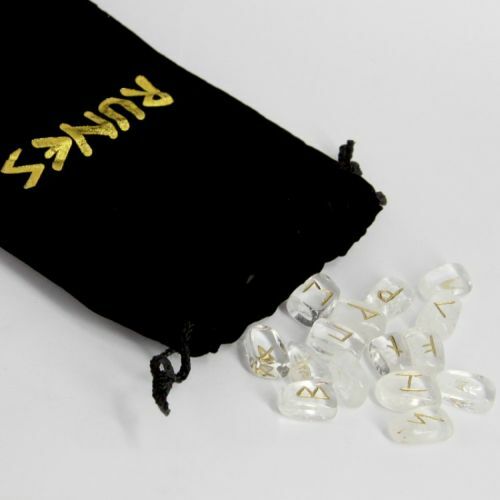 Your Runes come in a soft draw-string bag with instructions. 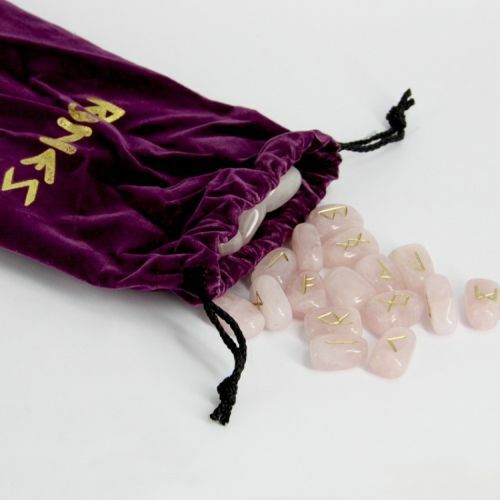 A set of 25, natural tumbled Rose Quartz Rune Stones embossed with gold runic symbols. 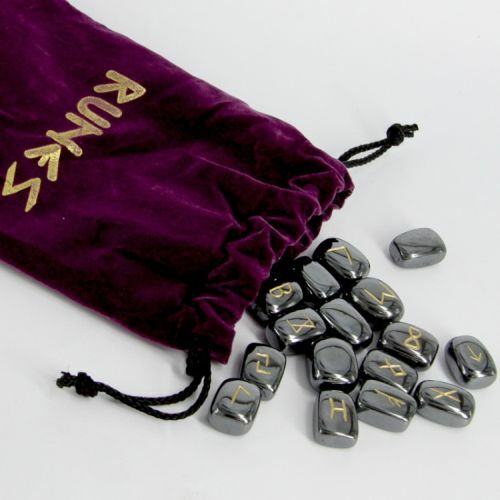 These Rune Stones are beautifully polished and so smooth to touch. 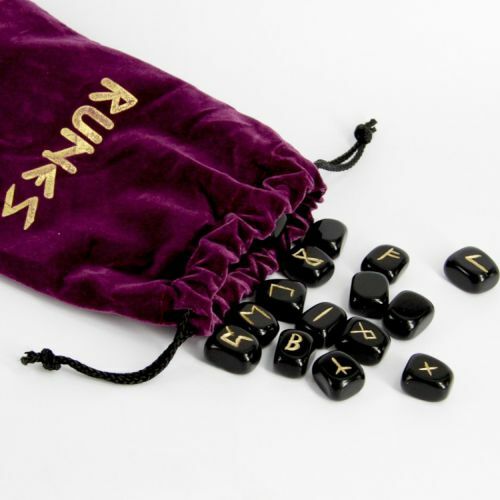 Your Runes come in a soft draw-string bag with instructions. A gentle pale to medium pink, translucent form of quartz. 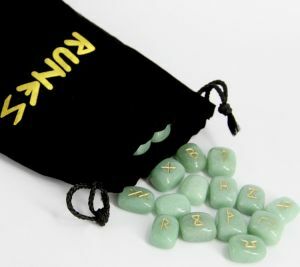 Known as the "Love Stone" or stone of the Heart, for giving and receiving love, calming emotions and soothing jealousy. 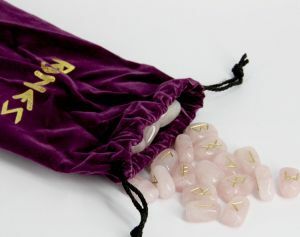 Rose Quartz encourages compassion and harmony. 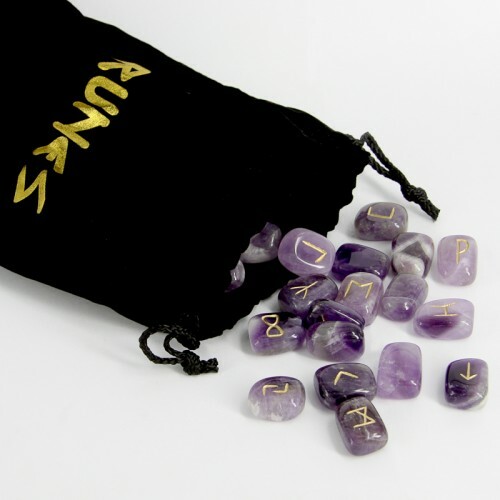 A set of 25, natural tumbled Amethyst Rune Stones embossed with gold runic symbols. 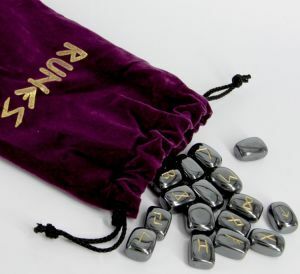 These Rune Stones are beautifully polished and so smooth to touch. 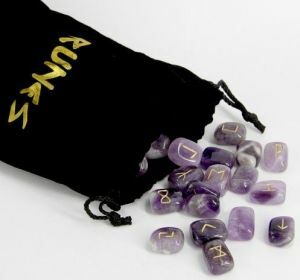 Your Runes come in a soft draw-string bag with instructions. 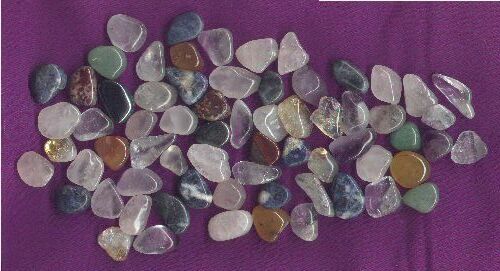 A regal violet form of quartz, sometimes with whitish stripes and can range from the palest lilac to the deepest purple. Known as the "Peace Stone", for meditation and spirituality. This page is installed with Magical POP-UP info - CLICK any TELL ME ABOUT link - shows pop-up information about the Crystal.